Gum disease develops when the bacteria found in plaque begins to build up around the teeth and gums. This build-up causes the gums to become red and inflamed. If the plaque is not removed with daily brushing and flossing, the bacteria can damage not only your gums and teeth, as well as the supporting bone. This can lead to teeth becoming loose, falling out, or eventually requiring extraction by a professional. Normal, healthy gum tissue appear a coral pink color. In addition, healthy gum tissue securely and tightly hugs the teeth. While brushing, flossing or eating certain foods, the gums will remain pink and firm, without any bleeding or swelling. 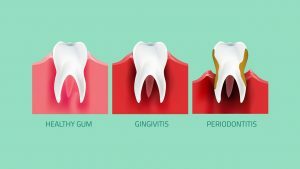 The early stages of gum disease can often be treated and reversed by practicing proper brushing and flossing techniques. Maintaining proper oral hygiene will help prevent any future plaque build up. The only effective way to remove tartar (plaque that has built up and hardened) is with a professional dental cleaning. For more severe cases of gum disease, such as advanced periodontitis, scaling and root planning is recommended to effectively remove the plaque and tartar that has grown below the gumline. Scaling helps remove the plaque above and below the gumline, while root planning is performed to smooth any irregularities on the teeth roots.